Themes include small-scale turbulence & mixing, large scale air-sea interaction (intraseasonal oscillations and such), mesoscale oceanic eddies, baroclinic instabilities, continental shelf flow and equatorial dynamics. My toolkit includes observational records from moored and satellite platforms as well as high resolution idealized process-study models. With other collaborators at UW and NOAA/PMEL, we are working to understand the heat budget of the equatorial cold tongue using a series of high resolution nested simulations of the eastern equatorial Pacific (above: SST from a MITgcm simulation courtesy Scott Bachman). This work is funded by NOAA's PUMP project. 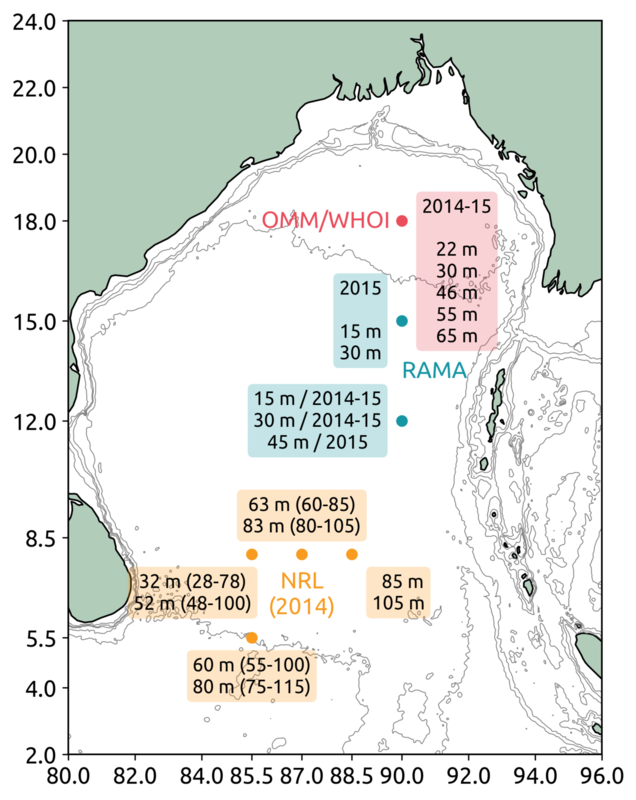 Multiple year-long moored turbulent mixing measurements collected using fast temperature sensors (χ-pods) as part of the ASIRI/EBoB/RAMA programmes paint a picture of mixing across the Bay of Bengal that spans multiple time scales: interannual to diurnal and shorter. Interesting signals include interannual & intraseasonal variability, a daily cycle in turbulence, depressed turbulence in barrier layers, elevated mixing associated with the tropical cyclones and a quiet ocean below 50m. 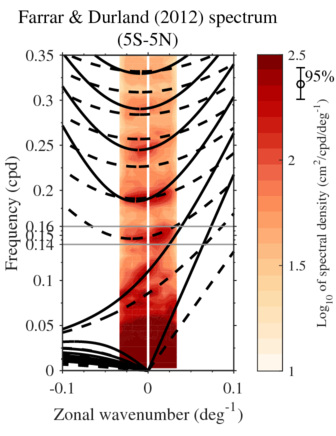 An estimate of the vertical structure of diffusivity KT is available here. One chapter of my thesis focused on the shelf flows forced by mesoscale eddies translating at the shelfbreak. The flow field is summarized below. What I found most interesting was the difference in vertical structure of the cross-shelfbreak flow. The shelf-water outflow is approximately vertically uniform whereas the eddy- and slope-water inflow is strongly sheared. Our paper explains why this happens. My dissertation looked at the interaction of deep-ocean mesoscale eddies with continental shelf-slope topography. When visualized using passive tracer fields (red tracks eddy water and blue, shelf-slope water), the interaction clearly results in the formation of smaller-scale secondary vortices. We term these 'stacked' vortices to reflect their (unexpected) vertical structure wherein shelf-slope water is stacked over eddy water. Observational evidence for these features remains elusive. Here's a video showing the evolution of a passive tracer. The southern boundary is the coast, the eddy is started in the northeast in deep water (flat bottom) and the β > 0. 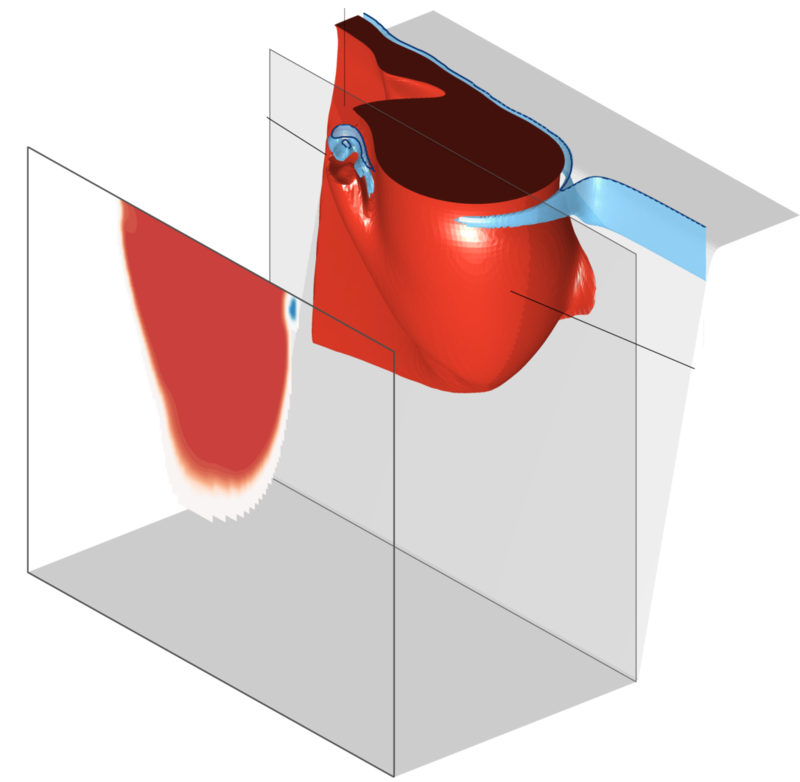 The lower panel shows a time series of volume flux of shelf water: defined to be water parcels that start on the shelf at t=0. The shelf is ≈ 40 km wide and the continental slope is 50 km wide. Satellite observations give humanity an unprecedented detailed look at the surface ocean. The vertical structure of variability associated with surface signals is relatively less known, and the relevance of theoretical structures derived using strict assumptions is debated; viz., the so-called baroclinic vertical modes. Motivated by the [zonal wavenumber]-frequency spectra of dynamic height calculated by Farrar & Durland (2012) — see image on right — my goal is to infer the vertical structure of 7-day period inertial-gravity waves in the equatorial Pacific (filter band marked by horizontal lines). I am using long term subsurface temperature measurements and inferred dynamic height from the TAO/TRITON project. Cherian D.A., Shroyer E.L., Moum J.N. in prep. Observations of the seasonal cycle of mixing in the Bay of Bengal. Cherian D.A., Brink K.H. (2018) Shelf flows forced by deep-ocean anticyclonic eddies at the shelfbreak. accepted. Journal of Physical Oceanography. DOI PDF. While at MIT, I took the semester-long Teaching Certificate Program. I learned that it is generally more effective to have students work through a derivation primarily on their own in class with hints. Following that advice, I created worksheets that guide students through a derivation, guiding them toward important implications and reasoning for various steps. Here are the ones I have so far. These are targeted at beginning graduate students. Any comments you might have on these are welcome. Please send me an email. Latex source is also available on request. At Real Climate, great animations of the change in temperature distributions over the past century. Another sweet temperature anomaly animation. NASA's State of the Ocean tool makes it really easy to flip through a bunch of ocean surface variables. Stunning fluid dynamics images from Dr. Megan S Davies Wykes at DAMTP. Great python notebook on visualizing data with high dynamic range. Apparently, histogram equalization (contrast enhancement) is a pretty good default. Here's the equivalent MATLAB function. From the Climate Impact Lab, a great map of projected temperature increase around the world. Visualizing chemical reactions: Beautiful Chemistry, and the sequel Envisioning Chemistry. Brief history of CO2 emissions - Interesting visualizations of the geography of CO2 emissions. Related: A year in the life of Earth's CO2. Climate change crochet: The global warming blanket. SciVisColor: Another great colormap resource. Useful post on "colormap strategies". Nice example of hillshading + contours + colormaps. Your Friendly Guide to Colors in Data Visualisation : Fantastic! Great talk by Jonathan Corum, science graphics editor at the New York Times, on designing for an audience. How the world's climate zones are shifting. Bhāvanā - a magazine at the intersection of math & history in India. Good stuff! Also featuring interviews — e.g. Roddam Narasimha (Part 1, Part 2), KR Sreenivasan. 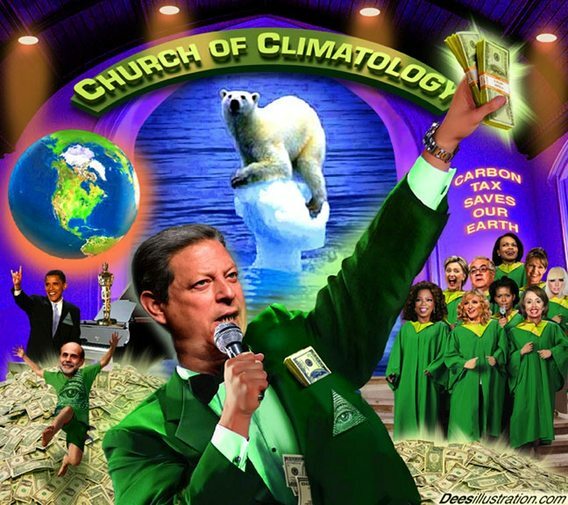 Forecast: Climate science podcast with Nature's editor for climate science, Michael White. Interviews with meteorologists, oceanographers, environmental economists and more! E.g. Jen MacKinnon, Carl Wunsch. Fermat's library featured an annotated climate science paper — Hansen et al. (2013)! SHERPA/RoMEO: Simple summaries of journal copyright policies. Climate simulations of Middle Earth and Game of Thrones by Dan Lunt. Old Weather: help scientists recover data from ship logs. Proceedings of the 'Aha Huliko'a Hawaiian Winter Workshop. 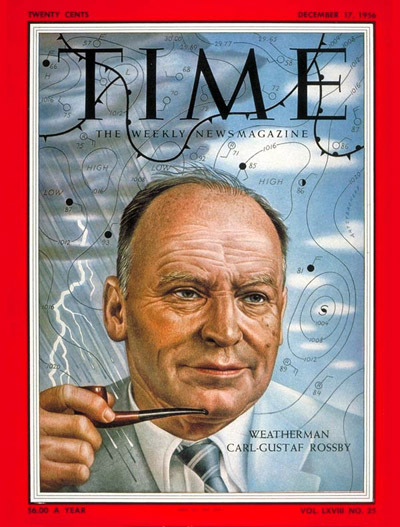 Carl-Gustaf Rossby on the cover of TIME magazine. It isn’t a simple tale of over-confidence in algorithms in the face of black swan events, but rather a tale of poor communications and siloed researchers that slowed down the ability of the wider community to see and interpret what was going on. On why people search for large prime numbers. The Datasaurus Dozen (Same Stats, Different Graphs). IPCC video on climate science outreach. The incredible way the GOES-R imager scans the Earth, and space. Jody Klymak has Jupyter notebooks on signal processing with Python. PyViz: Visualization in python: great tutorials! My work has been funded by the US National Science Foundation and the Office of Naval Research. Styling gratefully borrowed from Ethan Schoonover, Nicolas P. Rougier and Matthew Butterick. Icons from FontAwesome and Academicons.